The new year brings the opportunity for new starts and fresh ideas. This month we have focused on original thinking and the transition of creativity from one year to the next. 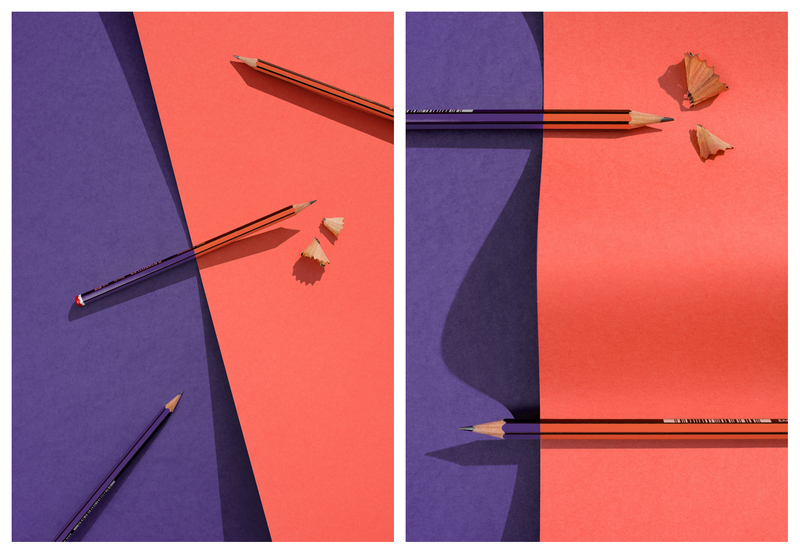 For the creative concept of this shoot we chose to feature the humble pencil, as we wanted to champion original ideas paired with a ‘back to basics’ look and feel. When it came to the choice of pencil, we felt there was no other option than the iconic Staedtler yellow and black striped pencil, ‘Noris’, as it represents an iconic, classic look, that we are all familiar with. For the background we worked with coloured card in the Pantone of the Year 2018 ‘Ultra Violet’ and this year’s Pantone ‘Living Coral’. By manipulating and working with the card, using hard light, we created interesting and sharp shadows that complemented the clean lines and angles of the pencils. For the final touch and to strengthen our message of a transition from one year to the next, we shifted the yellow hues of the pencils to match their respective background whilst retaining the black stripes for identity. By applying this defined, sharp hue shift, it complements and reinforces the shapes, lines and shadows. A clean and simple example of product photography & styling with the key message of original thinking in 2019.